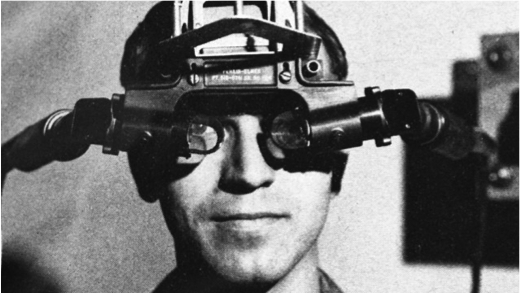 In 1966 Professor Ivan Sutherland at Harvard University made the first Head Mounted Display with a transparent display. It used one of two 6 DOF trackers which were ultrasonic tracker or mechanical tracker. This headset was used to view a cube in front of the user because of it’s limited processing power. This headset was a great first step to HMD but was too heavy for a user to wear on their head, so it was hung from the ceiling and it is where it got it’s nickname of the sword of Damocles from Greek mythology. In 1990 Professor Tom Caudell and David Mizell coined “Augmented Reality” working within Boeing’s Computer Services’ Adaptive Neural Systems Research and development project in Seattle. The objective of his software was to view where cables in the building process were supposed to go rather than having to check the manual. In 1992 Steven Feiner, Blair MacIntyre and Doree Seligmann submitted a paper for Knowledge-based Augmented Reality for Maintenance Assistance otherwise known as KARMA. This HMD they built overlaid a printer with a ghostly line visualisation on how to service it. In 1995 Jun Rekimoto and Katashi Nagao create the NaviCam. Built around colour tracking it detected color-coded markers in a camera that was mounted close to the eye. The results were then displayed on a see through video feed. However this system was still tethered and required a nearby powerful computer. In 1999 ARToolkit was released by Hirokazu of Nara Institude of Science. This was released to the open source community and was one of the first steps in opening up development of augmented reality to people other than research and development. 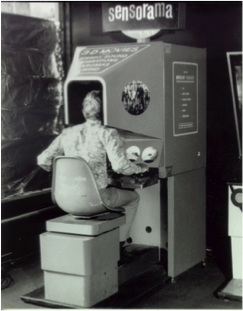 This was before the smartphone was created but now AR was that this was available to everyone and the home computers could run it. This entry was posted in Augmented Reality, General, Virtual Reality by Will Powell. Bookmark the permalink.